Stanthorpe is a town situated in south east Queensland, Australia. The town lies on the New England Highway near the New South Wales border 223 kilometres (139 mi) from Brisbane via Warwick, 56 kilometres (35 mi) north of Tenterfield and 811 m above sea level. The area surrounding the town is known as the Granite Belt. At the 2016 census, Stanthorpe had an urban population of almost 5,000. Stanthorpe was developed around Quart Pot Creek which meanders from south-east through the centre of town and then out through the south-west, where its confluence with Spring Creek forms the Severn River. Quart Pot Creek forms part of the south-western boundary of the locality, while the Severn River forms part of the south-western boundary. The New England Highway passes through the town from Applethorpe to the north to Severnlea in the south. Originally it passed through the town centre along the main street, Maryland Street. However, it now bypasses to the west of the main developed area of the town. The Stanthorpe-Texas Road connects Stanthorpe to Broadwater to the west and then travels south-west to Texas. The land within the boundaries of Stanthorpe is primarily used for urban purposes: housing, recreational, commercial and industrial with some undeveloped land on the hillier slopes. Although an agricultural centre of the Granite Belt, there is little agriculture within the town's boundaries. Crops grown in the surrounding area include vegetables, apples, grapes and stone fruit. Wine is also produced in the area, and sheep and cattle grazing is also prevalent. Stanthorpe was founded by tin miners. People came from many countries to mine tin from 1872. Prior to 1872 this area boasted some large pastoral runs and a few prospectors in bark huts. At that time, the area was known as ‘Quart Pot Creek’. The Private Township of Stannum existed in the area along one side of the present main street. With the discovery of tin and the influx of miners and new businesses, a ‘more suitable’ name was sought by the town fathers. Thus, Stanthorpe became the name which encompassed all, as this area became for a time, the largest alluvial tin mining and mineral field in Queensland. Stanthorpe literally means 'tintown', as Stannum is Latin for 'tin' and thorpe is Middle English for 'village'. When the tin prices fell many miners turned to farming. The subtropical highland climate was very suitable for growing cool climate fruits and vegetables. Grapes were first planted here in the 1860s with encouragement from the local Catholic parish priest Father Jerome Davadi to produce altar wine. His Italian descent made grape growing and wine production a familiar pastime and the notion caught on in the area. There were plenty of Italian settlers and wine was made for home enjoyment. The railway reached Stanthorpe in May 1881. The Post Office with a clock tower and an elaborate coat of arms was constructed in Maryland Street in 1901 in the Arts and Crafts style. Following Federation, the Commonwealth Government took charge of post and telegraphic services. However, they contracted the construction of post offices in Queensland to the Public Works Department of the Queensland Government and the Stanthorpe Post Office is believed to be one of the first ordered by the Commonwealth Government. It was designed by the first Commonwealth Government Architect John Smith Murdoch. The cool dry climate was valued as an aid to health from the early nineteenth century especially for those suffering from tuberculosis or chest conditions. Following the First World War, Stanthorpe was a major resettlement area for soldiers recovering from mustard gas exposure. Many of these Soldier Settlers took up the land leased to them in the areas around Stanthorpe which now bear the names of First World War battlefields. Owing to its elevation, Stanthorpe features a subtropical highland climate. 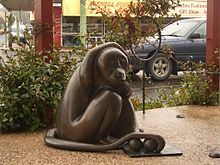 At an altitude of 811 metres (2,661 ft), Stanthorpe holds the record for the lowest temperature recorded in Queensland at −10.6 °C (12.9 °F) on 23 June 1961. Sleet and light snowfalls are occasionally recorded, with the most significant snowfall in over 30 years occurring on 17 July 2015. Stanthorpe Library and Regional Art Gallery is Lock Street beside Weeroona Park (28°39′13″S 151°55′57″E﻿ / ﻿28.6537°S 151.9326°E﻿ / -28.6537; 151.9326﻿ (Stanthorpe Library and Art Gallery)). Both are provided by the Southern Downs Regional Council. The Stanthorpe Library opened in 1987 with a major refurbishment in 2004. There are many local events, including the Australian Small Winemakers Show, the biennial Apple & Grape Harvest Festival, Ballandean Estates' Opera in the Vineyard and the Stanthorpe Show. Rebel FM 97.1 MHz was Stanthorpe's first commercial FM radio station. Rebel FM has a new & classic rock music format. The Breeze broadcasts on 90.1 MHz with an easy adult contemporary & classics hits format. Both stations are part of the Rebel Media group. Toowoomba based station CFM also broadcasts in Stanthorpe on 97.9 MHz. CFM is a part of the Australia wide Southern Cross Media network. The Stanthorpe area is served by a local Community Radio Station Ten FM. The Station is currently transmitting on 98.7 MHz with a low power transmitter situated on Mount Marlay. The station has in 2011 upgraded its Stanthorpe studios with a new mixing desk, new computers and professional grade monitor speakers. Ten FM has a local focus, derived in part from the stringent rules controlling Community Radio Stations. The station transmits a broad range of programs to attract the widest audience. In particular, the station broadcasts Italoz, a weekly program with an Italian theme to cater for the many listeners around the Stanthorpe area with an Italian background. The Border Post is the only paid local newspaper servicing the district. The Stanthorpe Border Post is relied upon for its coverage of local news and events. Stanthorpe is also serviced by a Christian radio network rebroadcasting on FM 88.0 MHz. It features programs about health, lifestyle, children's programs and interesting interviews. Stanthorpe and the surrounding Granite Belt and Granite Highlands area of South East Queensland and Northern New South Wales are the centre of a booming winery and national parks tourist destination. There are more than 50 wineries in the Granite Belt area. The Granite Belt national parks are Girraween, Bald Rock, Sundown, and Boonoo Boonoo. The region operates its own wine and tourism marketing body named Granite Belt Wine Country. There is a wide range of restaurants, accommodation places and other tourist venues. Backpacking is popular and there is large demand for fruit and vegetable pickers from November until May each year. Several private art galleries operate in Stanthorpe including the Glen Aplin Art Gallery which supports emerging artists and musicians who wish to display new works and perform at public functions. Storm King Dam offers some good angling opportunities for Murray cod, yellowbelly and silver perch. Parkland has been developed along both sides of Quart Pot Creek as it flows through Stanthorpe with a network of paths for walking and cycling with bridges and other crossings. The Southern Downs Regional Council operates the Stanthorpe Civic Centre Complex and council offices in Marsh Street (28°39′14″S 151°56′02″E﻿ / ﻿28.6539°S 151.9339°E﻿ / -28.6539; 151.9339﻿ (Stanthorpe Civic Centre Complex)). The Stanthorpe branch of the Queensland Country Women's Association has its rooms at 5 Victoria Street. Stanthorpe has a private co-ed catholic school, St. Joseph's School, servicing Preparatory to Year 12, as well as 3 main state funded institutions: Stanthorpe State Primary School, servicing Preparatory to Year 7; Stanthorpe State High School, servicing Year 8 to Year 12; and the Queensland College of Wine Tourism. There are also handfuls of smaller state primary schools scattered throughout the region. The towns first Bachelor level tertiary institution, The College of Wine Tourism, was opened in 2007. The college operates in co-operation with the local Stanthorpe State High School, as well as other regional schools, providing secondary, undergraduate, and graduate certification related to wine and tourism industries. Stanthorpe is on the Southern railway line. However, as at 2015, there are no scheduled passenger services operating to Stanthorpe railway station. The Southern Downs Steam Railway operates a tourist steam train most months from Warwick to Wallangarra & return, stopping in Stanthorpe. Stanthorpe Airport is a public airport operated by the Southern Downs Regional Council. There are no regular scheduled services to Stanthorpe. ^ Australian Bureau of Statistics (27 June 2017). "Stanthorpe (State Suburb)". 2016 Census QuickStats. Retrieved 3 January 2018. ^ a b "Stanthorpe" (Web article). Melbourne: The Age. 8 February 2004. Retrieved 17 February 2008. ^ Australian Bureau of Statistics (27 June 2017). "Stanthorpe (Urban Centre/Locality)". 2016 Census QuickStats. Retrieved 3 January 2018. ^ a b c "Queensland Globe". State of Queensland. Retrieved 8 June 2015. ^ Kerr, J.D. (December 1970). "The Centenary of the Southern Line". Australian Railway Historical Society Bulletin: 261–291. ^ "Stanthorpe Post Office". Register of the National Estate. Australian Government. Retrieved 6 June 2015. ^ "Other Attractions". Southern Downs Regional Council. Retrieved 10 June 2015. ^ "Stanthorpe Post Office". Australian Heritage Places Inventory. Archived from the original on 10 June 2015. Retrieved 10 June 2015. ^ "El Arish (entry 601633)". Queensland Heritage Register. Queensland Heritage Council. Retrieved 13 July 2013. ^ "Masel Residence (former) (entry 601552)". Queensland Heritage Register. Queensland Heritage Council. Retrieved 13 July 2013. ^ "Central Hotel (entry 600830)". Queensland Heritage Register. Queensland Heritage Council. Retrieved 13 July 2013. ^ "Stanthorpe Post Office (Place ID 105524)". Australian Heritage Database. Department of the Environment. Retrieved 1 October 2018. ^ "Sundown Tin and Copper Mine (entry 602209)". Queensland Heritage Register. Queensland Heritage Council. Retrieved 13 July 2013. ^ "Stanthorpe Soldiers Memorial (entry 601632)". Queensland Heritage Register. Queensland Heritage Council. Retrieved 13 July 2013. ^ "Quart Pot Creek Rail Bridge (entry 600829)". Queensland Heritage Register. Queensland Heritage Council. Retrieved 13 July 2013. ^ "Cherry Gully Tunnel (entry 601517)". Queensland Heritage Register. Queensland Heritage Council. Retrieved 13 July 2013. ^ "Queensland Extremes" (PDF). Australian Bureau of Meteorology. 30 September 2010. Retrieved 26 December 2010. ^ "Thick snow blankets parts of southern Queensland in what could be state's most significant snowfall in 30 years". ABC News. 17 July 2015. Retrieved 17 July 2015. ^ "Stanthorpe Leslie Parade". Climate statistics for Australian locations. Bureau of Meteorology. February 2013. Retrieved 13 January 2014. ^ "Libraries". Southern Downs Regional Council. Retrieved 10 June 2015. ^ "Stanthorpe Regional Art Gallery". Southern Downs Regional Council. Retrieved 10 June 2015. ^ "The Queensland Libraries Statistical Bulletin 2016-17" (PDF). Public Libraries Connect. November 2017. Retrieved 19 January 2018. ^ Stanthorpe Heritage Museum (brochure). Stanthorpe & District Historical Society. ^ "Australian Winemakers Show". Australian Small Winemakers Show. Retrieved 26 December 2010. ^ "Apple & Grape Harvest Festival". Stanthorpe Festivals Association. Retrieved 26 December 2010. ^ "Show Listing". countryshows.com.au. Retrieved 5 January 2017. ^ "BEST Employment Harvest Labour". Best Employment Ltd. Retrieved 28 December 2013. ^ "The Gallery". Glen Alpin Gardens. Retrieved 27 February 2017. ^ "Artworks on display at new exhibition opening". Warwick Daily News. 23 February 2017. Retrieved 27 February 2017. ^ "Quart Pot Creek". Queensland Government. Retrieved 10 June 2015. ^ "Stanthorpe Civic Centre Complex". Southern Downs Regional Council. Archived from the original on 10 June 2015. Retrieved 6 January 2018. ^ "Queensland College of Wine Tourism". Archived from the original on 17 February 2011. Retrieved 26 December 2010. ^ "Queensland College of Wine Tourism". University of Southern Queensland. 19 July 2009. Archived from the original on 2 December 2010. Retrieved 26 December 2010. 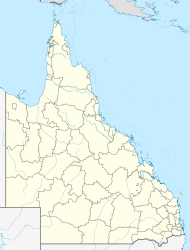 Wikimedia Commons has media related to Stanthorpe, Queensland. This page was last edited on 18 March 2019, at 05:09 (UTC).